You’ll enjoy this one folks. 1. I voted Democratic because I love the fact that I can now marry whatever I want. I now may marry my Labrador. 2. I voted Democratic because I believe oil companies’ profits of 4% on a gallon of gas are obscene but the Government taxing the same gallon of gas at 15% isn’t. 3. 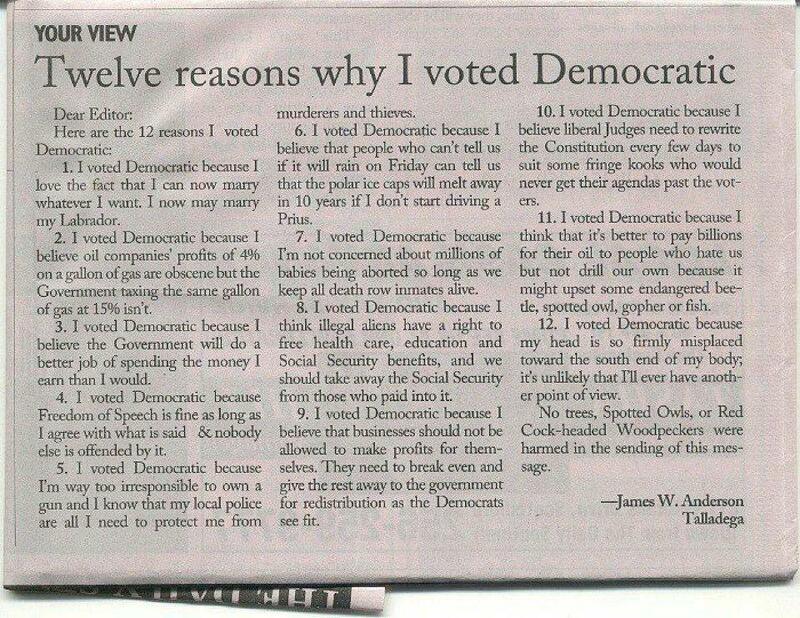 I voted Democratic because I believe the Government will do a better job of spending the money I earn than I would. 4. I voted Democratic because Freedom of Speech is fine as long as I agree with what is said and nobody else is offended by it. 5. I voted Democratic because I’m way too irresponsible to own a gun and I know that my local police are all I need to protect me from murderers and thieves. 6. I voted Democratic because I believe that people who can’t tell us if it will rain on Friday can tell us that the polar ice caps will melt away in 10 years if I don’t start driving a Prius. 7. I voted Democratic because I’m not concerned about millions of babies being aborted so long as we keep all death row inmates alive. 8. I voted Democratic because I think illegal aliens have a right to free health care, education and Social Security benefits, and we should take away the Social Security from those who paid into it. 9. I voted Democratic because I believe that businesses should not be allowed to make profits for themselves. They need to break even and give the rest away to the government for redistribution as the Democrats see fit. 10. I voted Democratic because I believe liberal Judges need to rewrite the Constitution every few days to suit some fringe kooks who would never get their agendas past the voters. 11. I voted Democratic because I think that it’s better to pay billions for their oil to people who hate us but not drill our own because it might upset some endangered beetle, spotted owl, gopher or fish. 12. I voted Democratic because my head is so firmly misplaced toward the south end of my body; it’s unlikely that I’ll ever have another point of view. Respectfully Submitted by SilenceDogood2010 this Thirtieth Day of November in the Year of our Lord, Two Thousand Twelve. I did not write this but it’s a good analogy to use. In the midst of his story, he looked at the professor and asked a strange question. He asked: “Do you know how to catch wild pigs?” The professor thought it was a joke and asked for the punch line.The young man said that it was no joke. The young man then told the professor that is exactly what he sees happening in America. The government keeps pushing us toward Communism/Socialism and keeps spreading the free corn out in the form of programs such as supplemental income, tax credit for unearned income, tax exemptions, tobacco subsidies, dairy subsidies, Obama phones, volatile mortgages, payments not to plant crops (CRP), welfare, medicine, drugs, etc. while we continually lose our freedoms, just a little at a time. If you see that all of this wonderful government “help” is a problem confronting the future of democracy in America, you might want to share this post. If you think the free ride is essential to your way of life, then you will probably disagree with this post. Respectfully submitted by SilenceDogood2010 this Twenty Ninth Day of November in the Year of our Lord, Two Thousand Twelve. County by County map of the US 2012 Presidential Election. County by County Unofficial results for the 2012 Presidential Election. Click to enlarge the image. 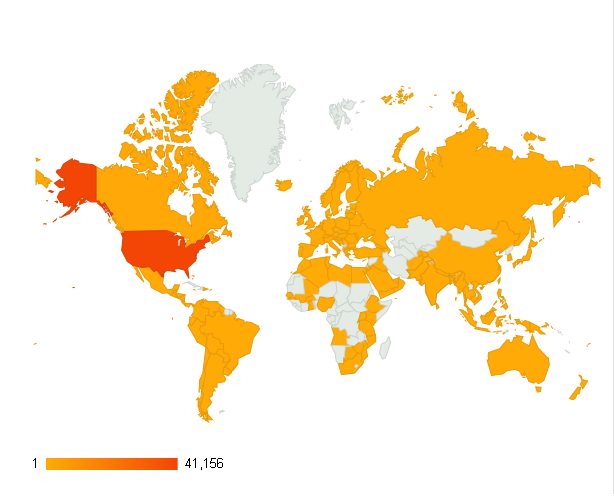 Since I began my journey into the Blogosphere, back in March of 2010, it seems that this site has gained some ‘International Popularity’. Respectfully submitted by SilenceDogood2010 this Nineteenth Day of November in the Year of our Lord, Two Thousand Twelve. As you may know, though we finished the race with the most votes on election night, we face a potential recount in the race. Many of you have asked for an update on the situation, an explanation of the process that is before us and how you can help us protect our hard fought victory. Hopefully, this email will help answer those questions. We won on election night with a total vote margin of approximately 11,500 votes out of over 4 million ballots cast statewide. Our opponent did not concede and we have not been certified as the winner. That certification will not take place until all “provisional” and outstanding “absentee” ballots are counted. There are approximately 47,000 of those ballots outstanding statewide. Provisional Ballots are ballots cast outside of the normal rules of the election. Usually it is when someone tries to vote at a polling site that is not their polling site, or when a person does not provide a legitimate address for their voting record, etc. In these instances, a person is allowed to vote, but with a ballot that requires greater scrutiny in the counting process to make sure fraud has not occurred. Provisional ballots are not counted on election night. They are counted after the elections when each county board of election has time to analyze the ballot and do the proper research to verify the validity of the ballot. Provisional Ballots are “subjectively” analyzed by the local county board of elections in each of the 100 counties. Each county picks the date they will view those ballots. The viewing of those ballots is a “public event”, open to members of the general public for viewing. While each county can decide the date to handle those ballots, the process must be completed and the results turned over to the state board of elections no later than Nov. 16th. When the provisional ballots are turned over to the State Board, if we continue to maintain a lead in excess of 10,000 votes, the race will be declared over and we will be certified the winner. If however, our lead drops below 10,000 votes, our opponent could then ask for a “recount”. Our opponent has publicly stated her intent to call for a “recount”. We are not fearful of a recount situation, as no statewide election in NC has been overturned by a recount. The only downside to the recount is the price tag, as the taxpayers would be on the hook for several million dollars to handle the recount in all 100 counties and our campaign would incur significant legal fees (in the hundreds of thousands) to ensure the integrity of the process in all 100 counties. The real challenge is not the “recount” which is pretty easy to monitor and a very objective process. The real challenge is the subjective viewing of the provisional ballots that takes place at the county level next week. Again that process is monitored and under the direct leadership and control of the local county board of elections. Each local county board of elections is governed by a three member board. Each of those boards is comprised of 2 Democrats and 1 Republican member, giving the opposing party majority control of the decisions on how to handle those ballots. Our fate lies in the decisions those boards make. Because the provisional ballot decision process is so subjective, we have retained the legal services of a firm that has extensive experience handling recounts in NC state elections. Under their leadership, we are building a legal team and volunteer corps of people to observer the 100 county boards as they handle and vote on the legitimacy of those ballots. This process is a labor intensive and expensive logistical undertaking and we have been working on it around the clock (literally) since Election night. Our need right now is financial. We have extensive legal bills which will grow exponentially if we go to a full-fledged recount. We need you to dig deep and help if you can by making a secure online donation here. Our need is immediate – as we retained our legal team 7:30 am the morning after the election and we are working around the clock. If you supported Dan in the election, stand by him now or it could be taken from us. Respectfully submitted by SilenceDogood2010 this Ninth Day of November in the Year of our Lord, Two Thousand Twelve. 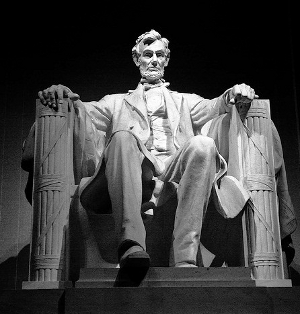 Eleven score and sixteen years ago our forefathers brought forth on this continent, a new nation, conceived in liberty, and dedicated to the proposition that all men and women are created equal. Now we are engaged in a great election, testing whether that nation, or any nation so conceived and so dedicated, can long endure. We have endured four years of great loss of liberty since the last election. This after many former years of losing liberty in prior such elections. We have coming to a point in time where we will decide if those who gave their lives and sacred honor for years in wars and elections so that this nation of liberty might live might have died or sacrificed in vain. It is altogether fitting and proper that we the current generations should have this opportunity to decide the future of this once great republic. But, in a larger sense, we cannot improve upon, but we can destroy and hallow out liberty. The brave men and women, some still living and many dead, who struggled here for generations before us, who have saved it, and passed it on to us to pass it on to future generations have sacrificed far more than us so that we may vote to decide our future liberty. The country will note, and long remember how we vote here, it can never forget if we saved liberty for future generations here. It is for us the living and soon to be voting, rather, to be dedicated here to the unfinished work for which they who fought and lived here before us have thus far so nobly advanced. It is rather for us to be here dedicated to the great task remaining before us—that from these honored generations we take increased devotion to that cause for which they gave much devotion and sacrifice—that we here highly resolve that these generations shall not have died or passed on to us liberty in vain—that this nation, under God, shall have a new birth of freedom on November 6, 2012— and that government of the people, by the people, for the people, shall not perish from the earth. Respectfully submitted by SilenceDogood2010 this Fourth Day of November in the Year of our Lord, Two Thousand Twelve. I’ve pulled out a few sections of it and addressed their statements 1 by 1. Their statement is in RED, Mine is in BLUE TEXT. Are there really 112 year old voters on the State’s Voter Rolls? Over the past several days, the State Board of Elections has answered numerous inquiries concerning alarming reports that there are 112 years old on the voter rolls and many of them have already voted in the 2012 General Election. Are these reports accurate? No. 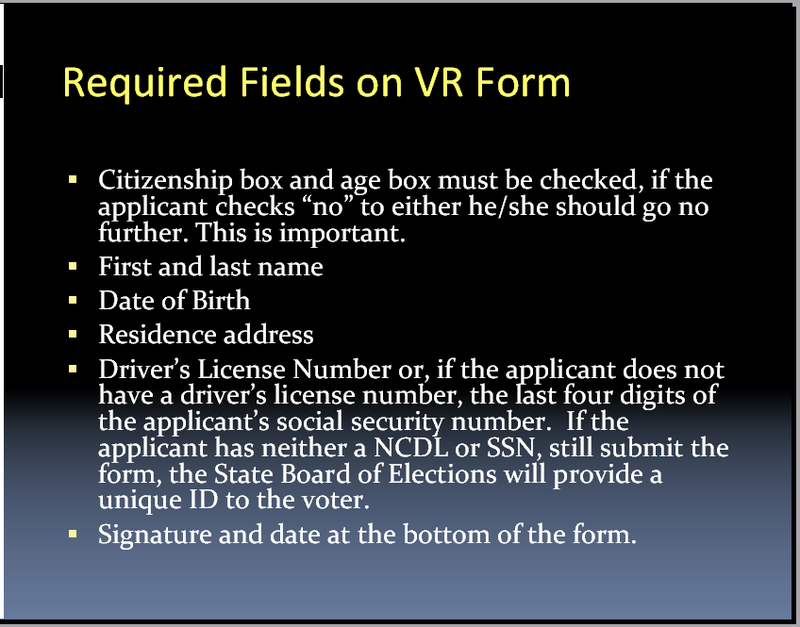 The facts are that prior to the National Voter Registration Act of 1993 (NVRA), there was no requirement in North Carolina law for a voter registration applicant to provide his or her date of birth. After the enactment of NVRA, North Carolina law was changed to require voter registration applicants to provide their full date of birth. Prior to this change a mere 20 years ago, while most registered voters had provided their date of birth, many had not. Since these “legacy” registered voters registered prior to the new requirement, our county boards of elections do not have these voters’ accurate date of birth. Instead, these voters were given a “legacy” birth date. The most common legacy birth date is 01/01/1900, hence the reason why certain voters appear to be at least 112 years old. This default date was chosen so these “legacy” voters would be obvious within the database to allow the county boards to take measures to ascertain these voters’ correct birth date. The State Board of Elections has crosschecked voter records against the DMV customer records. County Boards have updated legacy records as they receive voter changes and updates. 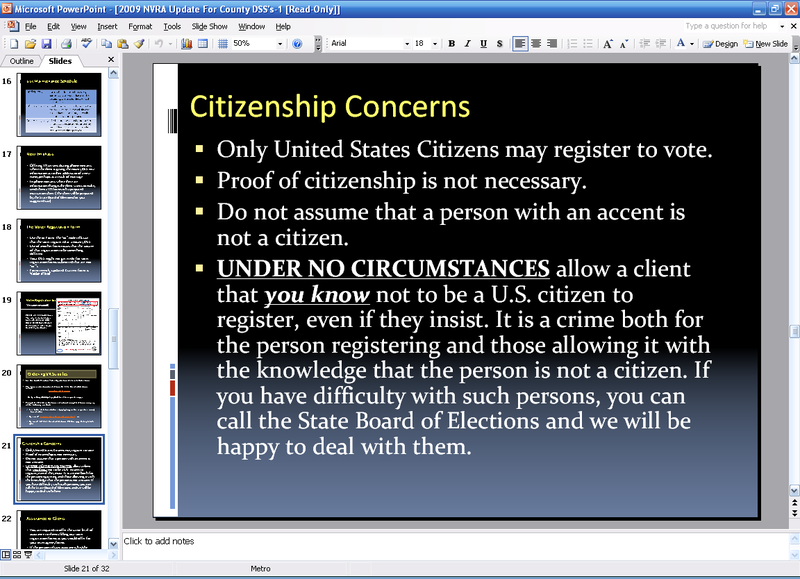 Since a voter’s age is listed on the voter lists on Election Day, if a voter or a precinct official notices a age discrepancy, the voter is given the opportunity to correct this information. Some county Boards have attempted to contact legacy voters to ask for their correct birth day. They have had over 3 years to contact these “Legacy Voters” and Ms. Myrick, along with many other individuals such as myself, HAS alerted them in years past. Again, these voters are not 112 years old, they are simply “legacy” voters from whom we do not have their correct date of birth. Now, onto item 2 —— I stumbled across a disturbing PowerPoint slide show that the NC State BoE used for training the local NC Departments of Social Services. I’ve pulled just a couple of slides, one that disturbed me, the other that shows that a “DATE OF BIRTH” is Required Info. Here’s a link to the full Powerpoint Slide Show. Slide #21 – Click to enlarge the image. Are they encouraging DSS employees to NOT VERIFY potential voters? Respectfully submitted by SilenceDogood2010 this Second Day of November in the Year of our Lord, Two Thousand Twelve.